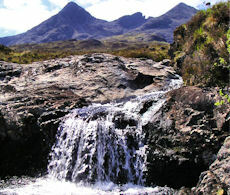 The Skye Cuillin needs no introduction ! The ridge is technically much harder than anything else in Scotland or elsewhere in the UK. Although the gabbro rock is grippy, some sections are also very loose and others are well polished, therefore slippy in the wet. Route finding can be difficult and having an experienced guide is the finest way to experience the Cuillin for the first time. 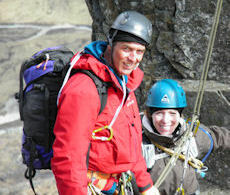 Our Skye events are led by our friends at West Coast Mountain Guides. Spend four days on Skye's famed Cuillin ridge. Rock-scramble along crests and ridges, with some 'moderate' climbing. 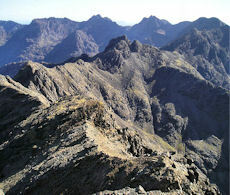 Bag all 11 Munros on the main Cuillin Ridge, including the famed 'Inaccessible Pinnacle'. Improve your rock-scrambling skills and enjoy and introduction to climbing on some of Scotland's airy routes. 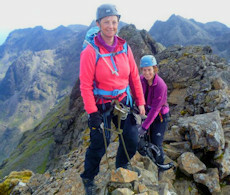 Join a small group lead by an experienced guide who knows the Cuillin extremely well. Rock-scrambling to Grade 3 and moderate rock-climbings. 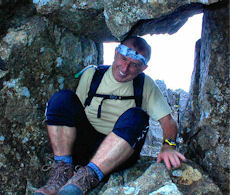 A 4 day event of guided hiking, rock-scrambling on the Skye Cuillin ridge with an experienced and qualified guide. All technical gear, including helmet and harness is included. Your guide will know the ridge extremely well and will also be able to give you insight into the flora, fauna and geology. Maximum guide to client ratio on this event is 1:3. Sgurr nan Eag, Sgurr Dubh Mor and Sgurr Alasdair - an introduction to the ridge and the rock. The Southern Cuillin peaks combine to give one of the easier sections of the ridge. This day makes for a fine introduction to the ridge and the rock. The views southwards to Rum are stunning ! Our trip begins at the southern end of the Cuillin Ridge. Heading from Glenbrittle into Coire Ghrunnda, the grandeur of the Cuillin becomes apparent. Our first peak is Sgurr nan Eag, one of the easier summits and a fine introduction to scrambling on Skye's gabbro rock. Progressing over Sgurr Dubh Mor to Sgurr Alasdair builds up confidence, with the day ending with a romp down The Great Stone Chute and walk back out from Coire Lagan. Scramble up Sgurr Mhic Choinnich, the famed Inaccessible Pinnacle and Sgurr na Banachdich. One of the tougher days on the ridge includes a climb up the 'Inaccessible Pinnacle' on Sgurr Dearg. This is the hardest of all Munros with an abseil down the short side. Our second day starts with a walk into Coire Lagan and up the An Stac screes onto the ridge at the col between the Sgurr Dearg and Sgurr Mhic Choinnich. We'll then tackle Sgurr Mhic Choinnich which builds on the skills we developed on the previous day. The 'Inaccessible Pinnacle' on Sgurr Dearg is next - a vertical blade of rock resting on Sgurr Dearg ! Once bagged, we've some slightly easier scrambling to take us over to Sgurr na Banachdich. The day ends with a pleasant walk out through Coire a'Ghreadaidh and past some beautiful waterfalls. 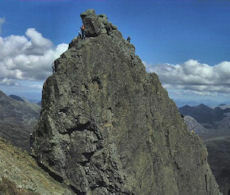 Two summits on the middle section of the Cuillin ridge at a relaxed pace. After the previous day, the middle section of the ridge is easier, almost tame. It's a chance to catch your breath while still enjoying the excitement of bagging two more Cuillin Munros. This day begins with a walk from the SYHA Hostel on a fine path up into Coire a'Ghreadaidh and past delightful waterfalls. We're heading for 'An Dorus' (which means 'the door') - the narrow col between the Munro summits of Sgurr a'Mhadaidh and Sgurr a'Ghreadaidh. From there we'll scramble up to these fine Munross, savouring the superb views from the summits. Our return takes up back to An Dorus and back through Coire a'Ghreadaidh. Narrow crests with technical scrambling on Sgurr nan Gillean, Am Basteir and Bruach na Frithe. Seen at its best from Sligachan, the northern section of the Cuillin Ridge looks jaggy and challenging. It doesn't disappoint and we'll be roped up for some more fun on as we bag the final 3 Munros on the ridge. We'll head from Sligachan around Coire a'Bhasteir to gain Sgurr nan Gillean's south-east ridge. This ridge is often referred to as the 'tourist route', but don't be fooled by this ! The ridge narrows and some local knowledge (which your guide has in abundance) helps to gain the best route to the summit. Down the 'west ridge', we'll rope you up for the descent to Bealach a'Bhasteir, then up Am Basteir, negotiating its infamous 'bad step' on the way. We'll end the day on a more relaxed note by walking over to Bruach na Frithe, the only summit on the Black Cuillin with a trig point ! The routes have fine approach paths leading to rough and rocky terrain higher up. We've classed all the days as 'demanding' primarily due to the terrain encountered. All days have some rock-scrambling up to Grade 2. The second and final days having some Grade 3 scrambling and some short sections of 'moderate' graded climbing. You'll need your general hiking gear appropriate to the conditions and time of year. We'll supply helmet, harness and any other climbing gear, but you are welcome to bring your own. More information and a checklist to download can be found on our Mountain Gear page. MIC and IML qualified, Ken is as happy bouldering on the sandstone boulders of Fontainbleau as he is climbing a technical route in the Alps or guiding a classic ice climb on the North Face of Ben Nevis. 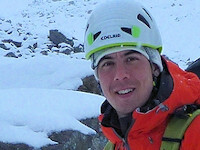 Ken owns and runs West Coast Mountain Guides and he'll confirm your booking direct. Sligachan, from where our final day begins, is easy to find, lying on the main A87 halfway between Broadford and Portree on Skye. The first three days begin from Glenbrittle, around a 10 mile drive from Sligachan, some of which is on single track road. There is a bus service to Skye and to Sligachan (see the Citylink bus timetables for more info). Please note that our expertise lies in offering you great guided days in Scotland's mountains and not in providing transport. Please note that our expertise lies in offering you great guided days in Scotland's mountains and not arranging your accommodation.